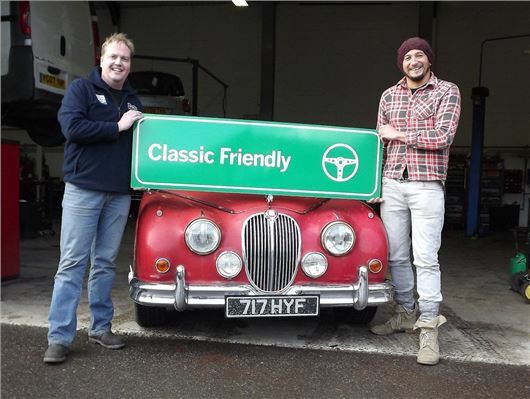 Fuzz Townshend, National Geographic Channel’s Car SOS presenter, has launched a new specialist network garage scheme called Classic Friendly. It sets out to offer cherished car owners a national network of quality garage services specialising in the servicing of pre-1960 cars. Fuzz (right), along with FBHVC-approved service facility owner, Lee Reynolds created Classic Friendly to ensure classic car owners can confidently choose their garage, no matter what part of country they're in by searching an online directory of businesses. They devised the vehicle inspections scheme with a view to assisting motorists to maintain their cars at an optimum service condition and thus comply with the law. According to Fuzz, the prime reason for the creation of the 'Classic Friendly' garage scheme was because of the number of cars on the road, which no longer legally require an annoual MoT inspection. He said: 'There may be owners getting out their pre-1960 cars, or considering using them, without actually inspecting them thoroughly or having them checked out beforehand. Garages participating in the Classic Friendly scheme will be listed on the website, and be inspected by me to ensure consistently high standards'. There are currently more than 200,000 pre-1960 cars and motorcycles in use on today’s roads. All vehicles checked-out by a Classic Friendly garage will receive a uniquely numbered certificate, displaying the basic overall results of the inspection. Inspectors log the results, which will be available to the vehicle's owner, as well as anyone invited to view the data - most notably classic car insurers. My name is Karen Howell, to cut a long story short my sister rang your Sos show few months back. She took it you weren't interested so has told me, however my health has deteriorated quite dramatically over the past six months, I have a rare condition of Anaphylaxsis which basically is life threatening disease due to being allergic to many things. My stag is like part of my little family but I haven't the resources or more importantly the energy to get her on the road again. I would like to give my triumph stag to you as a gift as I know deep in my heart you would take care of her .and bring her looking her best ,which I'm not in a position now ever to do . I'm so sorry I wouldn't be able to delivery her to you but you are more than welcome to collect her anytime. The only time I'm not home is when I'm having treatment in Oxford generally first week of every month, I'll be going next Monday 6/7 march but will be home from 8 th. I would actually like it if I could talk to you on the phone or face to face to explain hers and my background. It's twelve months later did you get in touch and accept the lady's offer of the Stag? Also hello Lee this is Eric that used to build your Citroen race car engines back in the day, that little 1600 16V with 200BHP is still one of my favourites. Hi Fuzz, I am in the middle of a complete body-off restoration of a DAIMLER SP250. I've seen in "Car SOS" that you know such a car very well. I'm interessted in the steering system which you changed. This "rackπnion" system, which type is it? I mean, is it a new one? Or is it coming out of a donor car? Which car type?